A few weeks ago I received a super exciting invitation for a VIP behind the scenes experience at The Saturdays concert in Newcastle. This took place on Tuesday and I just had to tell you all about my amazing experience! We arrived at Newcastle City Hall a few hours before the concert and were whisked off to the Garnier VIP room backstage. I felt very special being taken backstage! It was also great to catch up with some of my favourite North East bloggers. Each of the Garnier Ultimate Blends collection were laid out in the room for closer inspection. Basically there is a collection of hair products (shampoo, conditioner, treatment) for every hair type. You can find your Ultimate Blend here. The Saturdays are the spokespeople for the Ultimate Blends range and each one of them has their own collection in the range. We took it in turns to get our hair styled by the lovely Garnier stylists and I was given some lovely loose waves in my hair. It was really nice to get this done as I always wear my hair straight! I definitely need to experiment more with waves. A very special surprise happened once we'd had our hair done. We got to meet The Saturdays! The girls were all stunning, I just felt like I was staring at how beautiful they are! They are really lovely too so it was great to meet them. 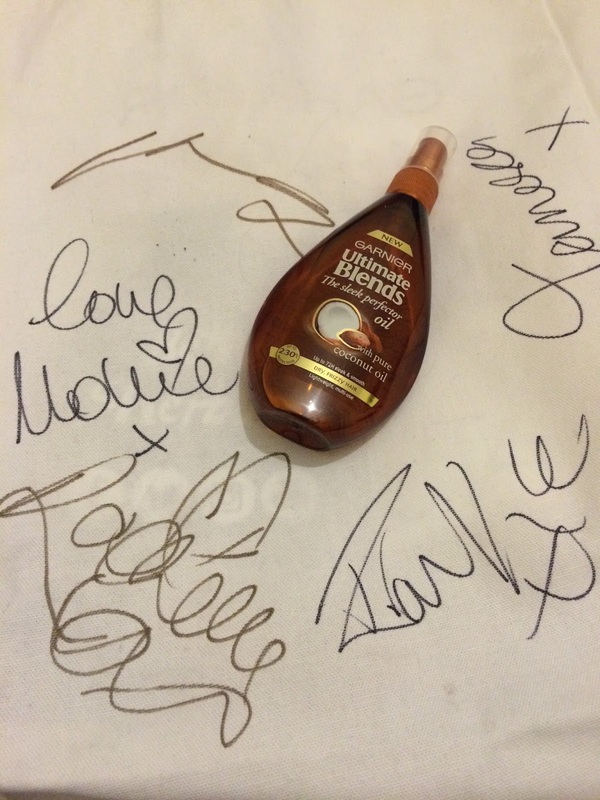 We'd been given a Garnier tote bag containing a gorgeous hair oil and they kindly signed our bags. After all of this fun, we got taken to our seats, which were fab by the way, and we got to watch the full Greatest Hits concert. I think I'd forgotten how many hits they've had over the years! They had some absolutely stunning costumes and had everyone up on their feet dancing and singing. It was a truly wonderful night and I'm super grateful to have been invited. Do you like The Saturdays? Have you tried any of the Garnier Ultimate Blends range?